Sound Transit is trading some fossil-fuel energy for wind power starting in 2019, for light-rail trains running through SeaTac. Sound Transit will buy 10 years of wind power to replace a dirtier mix of electricity where its trains run in SeaTac, the agency announced Tuesday. The supply for light rail, along with Angle Lake and Sea-Tac/Airport stations, currently comes from Puget Sound Energy, where coal and natural gas together provide 59 percent of the portfolio. But the contract for 2019-28 will replace those fossil fuels under PSE’s new Green Direct program. “When we reduce our own carbon footprint of that transit service, we’re creating an even larger benefit for the region,” said Amy Shatzkin, sustainability manager for Sound Transit. Other early subscribers include Western Washington University, King County, REI, Target, the cities of Anacortes, Bellevue, Snoqualmie and Mercer Island, and 116 Starbucks stores. All together, their commitments allow PSE to order 130 megawatts from wholesale wind farms that a developer is planning in Thurston and Lewis counties, said Heather Mulligan, the utility’s market manager for renewables. The Skookumchuck Wind Energy project would be built on Weyerhaeuser land southeast of Olympia, by RES Americas. These are new resources that aren’t expected to generate windfall profits, PSE says. “This is purely to serve our customers. They’ve been asking for us to supply more options for renewable energy. We’re hoping this project will meet that demand,” Mulligan said. 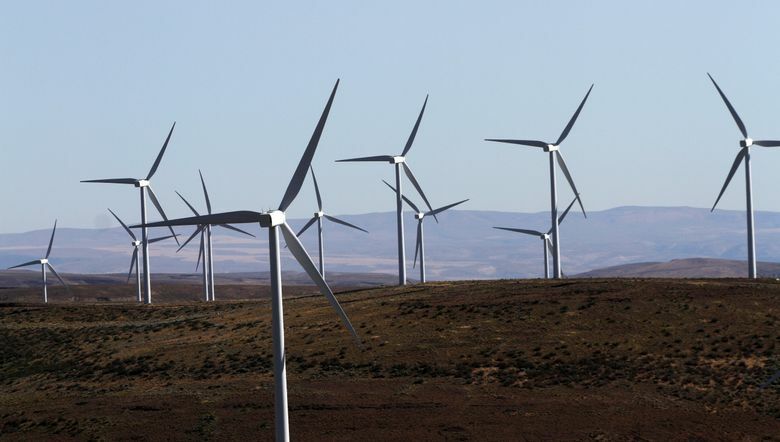 PSE already owns three wind farms in Eastern Washington. Sound Transit will spend 5.1 cents per kilowatt hour in 2019 for wind, compared with 4.7 cents in 2017 for general power — so there’s a slight premium. However, the agency may eventually save money, Shatzkin said. The deal locks in a 2 percent yearly inflation rate, so if other power rises 2.7 percent per year through 2028, Sound Transit staff say, they’ll break even. Forecasts range from 2.4 to 4.8 percent, Shatzkin said. Light-rail trains within Tukwila and Seattle rely on Seattle City Light, which uses 99 percent renewables, mainly hydropower. Sounder commuter trains run on diesel, though the agency is working to reduce emissions, Shatzkin said. Eight older-model Sounder locomotive engines have been overhauled since 2013, with three more scheduled this year, for a fuel savings of 2,000 gallons annually per engine. Trackside electricity is supplied at the Lakewood base, to reduce diesel use between trips. Sound Transit has set a goal of a carbon-neutral operation by 2030. Its wind power deal doesn’t include energy for Lynnwood, Overlake and Federal Way extensions during 2023-24, but Shatzkin said opportunities may arise.